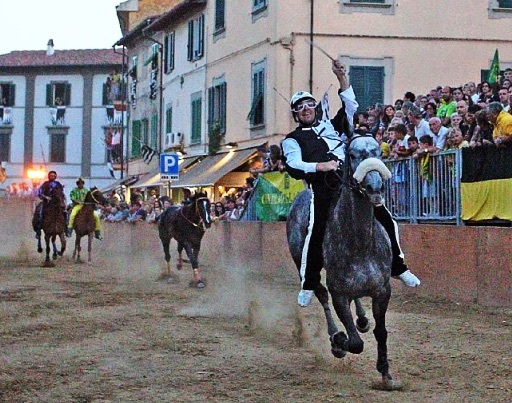 One of the most important events in Bientina is the Palio. It’s a famous horse race, where jockeys have to run aroud the square of Bientina. There are nine districts, each one has a different color. The district that wins receives a “cencio” and lots of money. The “cencio” is a painting made on a canvas and usually it represents horses, churches, districts and jockeys. The price for the tickets is 15€ for the tribuns and 10€ for the square. If you come by car you can park it in the parkings nearby and it’s free. The night before the Palio in each district there are some dinners where people can take part and they sing tipical choirs. I love this event, because since I was a child, I have always watched this race and it’s an important tradition in Bientina and the inhabitants love it.